There have been a number of players who come and go through the Spurs teams of the past without making a mark, but some have a place in Tottenham history and leave an impression without necessarily hitting the headlines every week. One such player appeared as a substitute in three FA Cup Finals and was a shining young star when he broke into the first team, but was struck with injuries and misfortune that resulted in a career that failed to fully blossom at the club. Garry Brooke was raised in Walthamstow and represented his school and district before being invited to join Spurs juniors and working his way up through the ranks. Like many Spurs youth players of the time, Brooke was loaned out to GAIS – a Swedish side who enjoyed the benefits of English players in their side, while they reaped experience of first team football. The nickname “Buddha” was applied to him, as his short, stocky frame gave him a resemblance to the religious icon, but his size was not a drawback as it was for some players, because his strength and power made up for any deficit in height. Indeed, in his first full game for Tottenham on Boxing Day at home to Southampton, he demonstrated his shooting ability with two fiercely struck shots that left the visiting keeper helpless and the home crowd breathless as they momentarily had to take stock of the situation to realise that the ball had flown in on each occasion. From that point he was a regular in the first team squad, sometimes as a substitute, but more often in the side. He got gained a foothold in the side and earned a place on the bench for the FA Cup Final against Manchester City at the end of his first season in the first XI. While all focus was on the head-down trudge of Ricardo Villa, who was substituted in the first game at Wembley, it was Brooke who replaced him, almost unnoticed. His performance was typically energetic and he must have been disappointed to be back on the bench for the replay, but picked up a FA Cup winner’s medal at the end of it. It was a view of the game that he was familiar with as he was there for both games the following May against Queens Park Rangers, but this time was involved in both games, collecting more silverware at the end of the 210 minutes. In that 1981-82 season he played in the first four games, but picked up a serious injury against Wolves and was out of the picture for the majority of the season, only coming back into the team in May, but forcing himself into the FA Cup Final squad at the last minute, as a replacement for Ossie Ardiles, who had joined Paris St. Germain to go into exile while the Falklands War raged. The next season started with Brooke as a sub, but after that first match, he became a regular selection and his industry in midfield and his passing and movement made him a difficult midfielder to track. In addition to this, his shooting was gaining notoriety and a spell of eight games yielded six goals including a hat-trick against Coventry City at White Hart Lane. Just when things were going so well, he was involved in a serious car crash in February 1983, which threatened his life. Only his physical condition and a will to battle back pulled him through and only seen months later he was back in the first team. 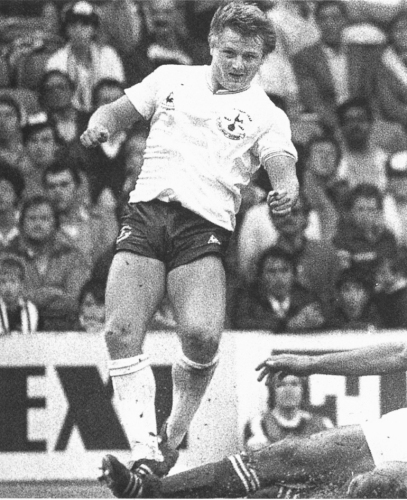 His appearances in the lilywhite shirt became more sporadic over the next two seasons as it became apparent that the effects of the crash and the injuries Garry sustained had taken something out of his game. In 1985 Spurs agreed to let him go and he joined the band of former Tottenham products at Norwich City for £50,000. It wasn’t the best move, because there was little opportunity to get a regular run in the side and he moved on after a year to Gronigen in Holland, where he was part of their UEFA Cup run and he played there for 18 months, before returning to England to settle again. Wimbledon took him on, but again, lack of opportunity saw him go to Brentford in 1990, signed by the manager - former Spurs midfielder, Phil Holder. It was the same story at Griffin Park that he had experienced at other clubs and he moved on, ending up in non-league football, but playing more regularly, he made an impact at Wivenhoe Town and St. Albans before calling it a day. Garry Brooke still turns out for the Martin Chivers Spurs Old Boys side and while his shape hasn’t changed, the legs are a little less willing. But every now and again, he will pull back that right leg and the ball will fly goalwards and the thought of the Saints keeper floundering as the net bulged come back to mind.